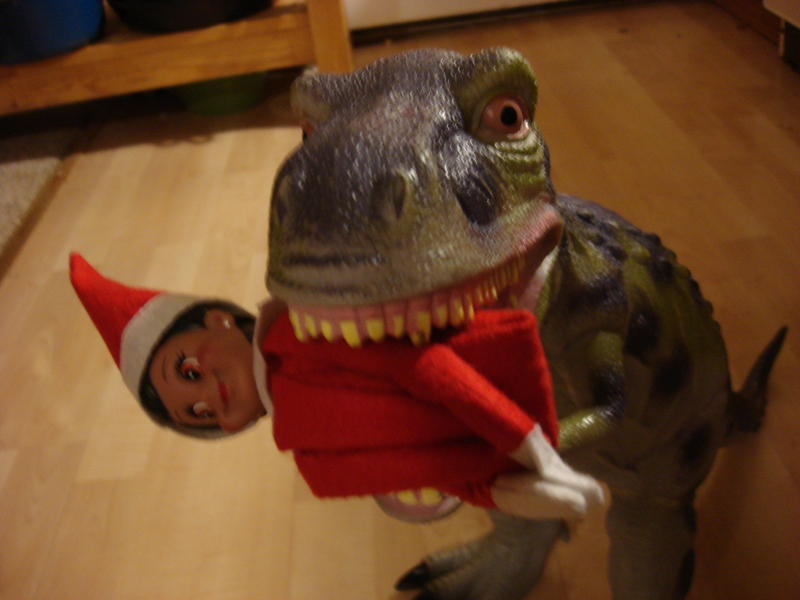 Lucia: Our Elf on the Shelf Is Very Entertaining this Year! Elf on the Shelf looks on the surface like yet another agent of torment for parents desperately trying to make it to Christmas in one gift-wrapped piece.Wrong, wrong, wrong. 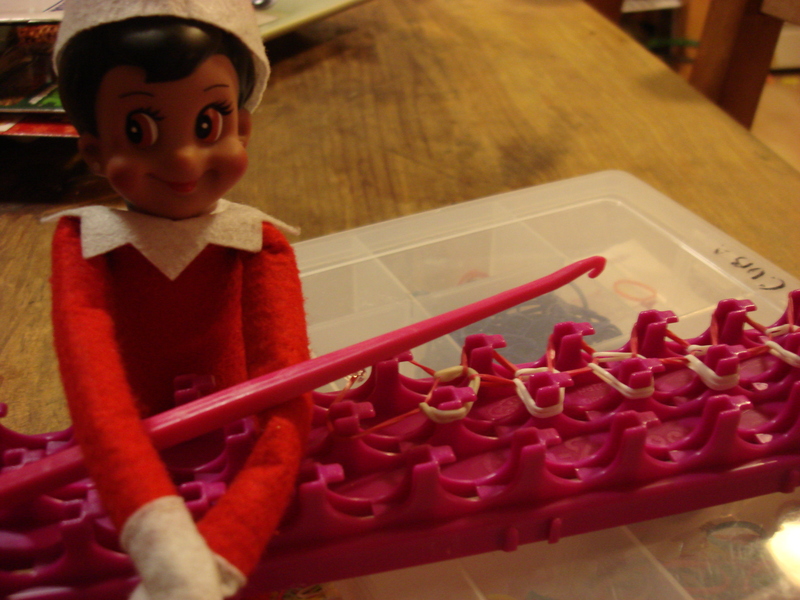 The Elf is proof positive that surveillance can be an effective deterrent (and that some of us really need to get a life — or a job that celebrates all this pent-up creative energy). Rainbow looms are all the range with the kids. Lucia borrowed his and made him a ring on her first day back! The elf appears each morning of December somewhere in the house. 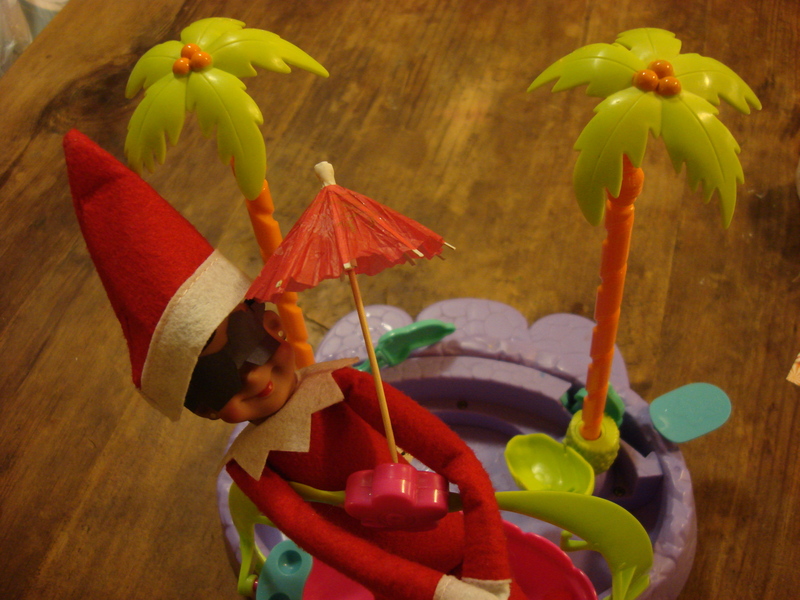 At night he/she heads back up to the North Pole to report back to Santa on the behavior of the children in the house. Different elves manifest different odd behaviors. Many appear in different places in the house each day, which clearly indicates to the kids that that little spy has been traveling to see the Big Guy with the Beard. 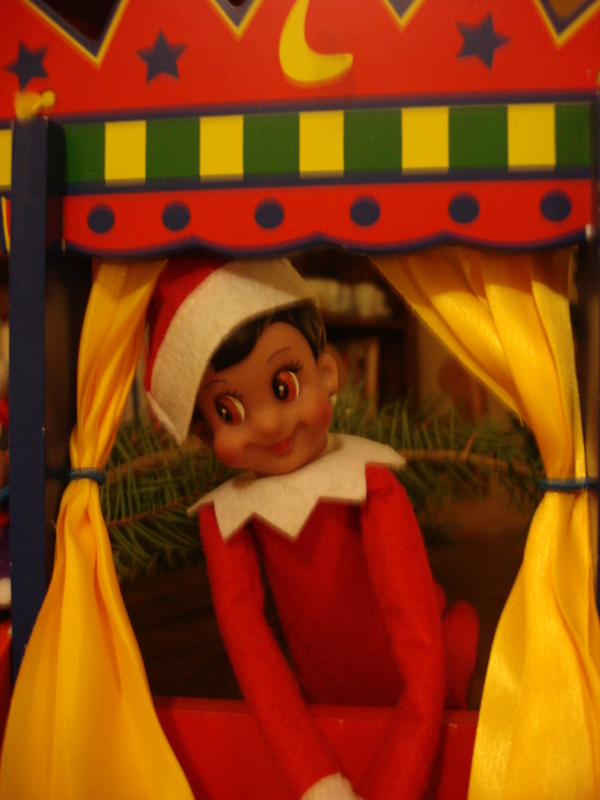 Other elves get up to mischief — I have heard of elves who toiletpaper the kitchen, gift wrap the toilet, paint the faces of sleeping children and other pranks (Lucia would be heading to elf heaven in tiny little elf pieces if she tried that in my house). Day 2 Lucia took the stage like the star that she is. Last year our elf, Lucia, did very little except turn up in different parts of the house, usually legs on either side of something, like a pole dancer in need of some professional development. Day 3 Future’s so bright….I gotta wear shades! This year, perhaps pressured by those other more interesting elves, Lucia has been playing dress-up. Each morning, my little man comes racing out of his bedroom to see what that crazy elf has been up to. And my darling son knows he’s being watched…he says sorry, excuse me, and please and thank you for EVERYTHING! I love that elf. Day 4 T-Rex takes a shine to our elf! So in a spate of non-food-related posts, I will be keeping you up to date on Lucia the Elf and her more entertaining costume changes. Is there an elf that can appear at my house and clean it? LOL! ROFL – have you seen the Caganer in the Catalan nativity scene? He’s even in the Barcelona cathedral nativity, squatting next to Joseph and Mary! OMG…the Caganer is completely new for me! I am very afraid (but very, very tempted) to show my son….No. I can’t! But I want to…. so cute! I made an elf for my son… it hasn’t gotten up to too much yet though!